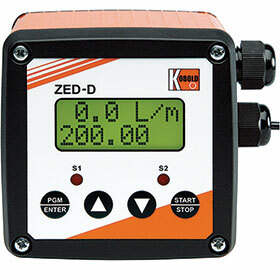 Kobold’s ZED-D electronic dosage devices are ideally suited for dosing and monitoring fluid media. They process the signals from separately-installed flow sensors and are mostly freely configurable. The devices are suitable not only for panel mounting, but also robust aluminium field housing (IP65) for wall or pipe mounting and direct fitting. For integration into standard industrial automation and monitoring systems, the intelligent electronics have two control inputs, one dosage output, plus another switch and one analog output. Two relays are provided for dosage and monitoring. Whether for pump control, flow monitoring or filling and fine dosing, a large variety of possible settings provides the best possible adjustment for the task at hand. This includes free scaling and a choice of engineering units, while a password protects any settings made against operating errors. A well-arranged, easily readable two-line display indicates the present flow and dosage quantity. The devices are operated by using menus and keys, and the start/stop button can be used to interrupt the dosage process. • 2 x relay outputs. • Free scaling, min/max memory. • 2 x 8-digit LC display, backlit. • Frequency input: 0,2-2000 Hz. • Switchboard installation or field casing.